Civilian enthusiasts, military and law-enforcement personnel can now safeguard expensive and indispensable handguns when traveling. Take to the road or friendly skies with the GunCruzer Universal 6-pack gun case – and experience the security and ease provided by yet another CaseCruzer innovation. The GunCruzer Universal 6-pack gun case ends the long wait for a dependable, indestructible means of transporting a wide variety of handguns. Aficionados, collectors and professionals who carry handguns for self-defense will all benefit. No damage, no worry. That’s the CaseCruzer credo. The base of this versatile carrying case is 5.87" deep and can store up to six handguns and 12 magazines in custom-cut closed-cell foam cavities. The gun cavity dimensions are 9.23”L x 4.75”H and can accommodate a wide range of name-brand models, such as Beretta, Colt, Sig Sauer, Smith & Wesson, Glock, HK (in popular caliber sizes ranging from: 9mm all the way up to .45). 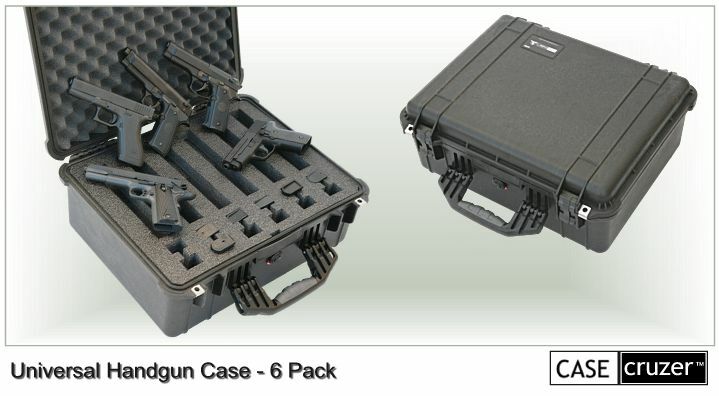 The Universal 6-pack gun case comes with reinforced padlock protectors to guard against cutting and theft. Foam plugs keep smaller handgrips snug. Prized handguns are secured in the Pelican case by the lid’s interior cushion, made of egg-crate-style convoluted open-cell polyurethane foam; lid depth is 1.75". Exterior dimensions of the crush-proof case are 20.69"L x 17.18"W x 8.56"H. Lots of space but no unnecessary bulk. Available in black only. The Universal 6-pack gun case is also watertight, with buoyancy up to 69.9 lbs, and dust and sand proof, with an IP67 rating. Other certificates include MIL C-4150J and STANAG 4280. But the benefits don’t end there. The case is airline safe (ATA 300) and can go the distance in extreme climates, with temperature ranges of minus 10 to 210 degrees Fahrenheit. That makes it ideal for outdoor shooting range environments, as well as critical Homeland Security missions involving various government agencies. In short, this trim, economical shipping case begs for action. Speaking of action, E-Z pack ‘n’ carry is the motto for GunCruzer’s newest offering in a long line of excellent protective products. When empty the Universal 6-pack with foam weighs only 11.9 lbs. To avoid the risk of mishap, the gun case comes with a single folding front handle with a no-slip over-molded cushion grip. Civilians may not be in a hurry when arriving at gun shows or sportsman events, but fast deployment and mobility are essential for those brave men and women who must maintain global law and order. Trustworthy and dependable comes with the GunCruzer territory. The exceptional, invulnerable GunCruzer Universal 6-pack gun case also arrives with an unconditional lifetime guarantee. Pelican would have it no other way. CaseCruzer, always one step ahead, would accept nothing less than the best of the best. Think Pelican is an impressive box office name? You’re right. But top billing always goes to CaseCruzer – a new class of high-impact watertight protective cases also known as Pelican Plus. CaseCruzer is a world leader in reusable carrying case solutions serving Aeronautics, Communications, Computers & Laptops, Electronics, Film & Broadcasting, Industrial, Medical, Photography & Videography, Transportation, and other markets. For more info about the new GunCruzer case, visit www.casecruzer.com; call 800-440-9925 in the U.S. or 909-613-1999 internationally; fax 909-465-5598; or write to CaseCruzer at 4665 State Street, Montclair, CA 91763.